Without a doubt, the South Coast of NSW has some of the most unique and iconic seascape formations in the world. One of these rock formations is the Camel Rock. 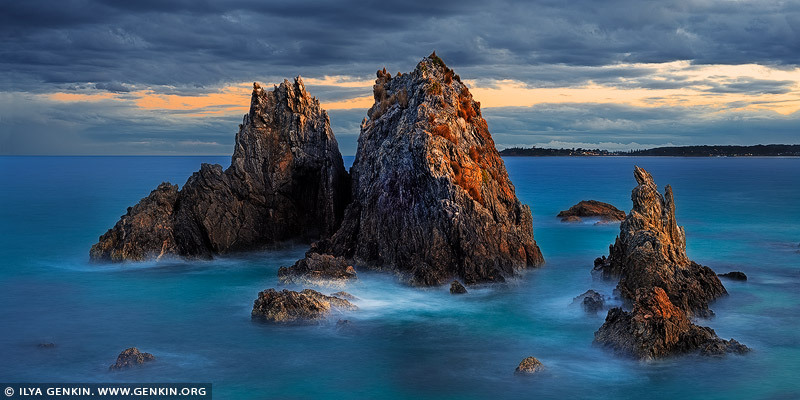 Camel Rock is small outcrop at the far end of a long sandy beach near the beautiful little seaside town of Bermagui in NSW, almost as far south as you can get before ending up in Victoria. You really have to have a vivid imagination to see this rocky outcrop as a camel. It looks more like a nesting emu and only from the beach. From all other places it's visible as three independent pyramid rocks, but it is worth visiting. This image belongs to the travel and nature stock photo library. This stock photo of Camel Rock at Sunset is available for licensing for commercial and editorial uses including websites, blogs, books, magazines, brochures and advertising. Restrictions may apply for images which contain third party copyrighted material or sensitive subjects. Photos of artwork are for editorial use only. This image id AU-BERMAGUI-CAMEL-ROCK-0002 of Camel Rock at Sunset, is copyrighted © by Ilya Genkin. This is not a public domain image.